The preschoolers who visit Anne Berblinger’s farm won’t just wander in and pick out an anonymous pumpkin. Instead, they will claim their own particular prize, the future jack-o-lantern that they chose as a seed, nurtured as a sprout, and later transplanted into the soil of Gales Meadow Farm. Anne, who owns the farm with her husband René, wanted the children to have a connection with their pumpkins, and more importantly, with the process of growing and harvesting crops. This concern for the integrity of the harvest is consistent with Gales Meadow Farm’s goal to produce wholesome, sustainable goods. 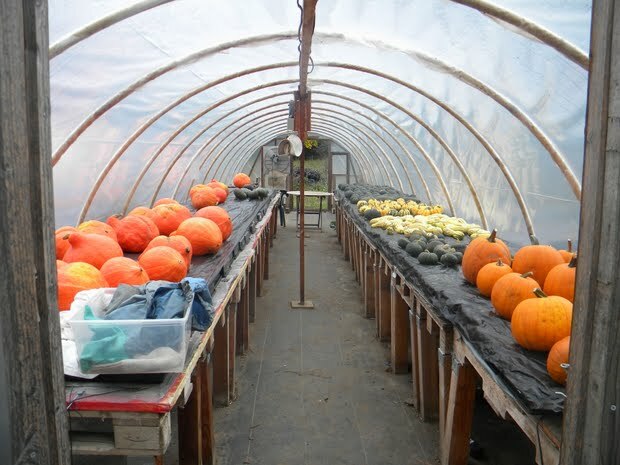 They don’t only grow pumpkins; in fact, on their seven acres of land, they grow over three hundred types of organic crops. To manage this incredible variety in a small space while maintaining the health of their farm, Anne and René make sure to plant crops with similar growth requirements (water, soil, etc.) together. 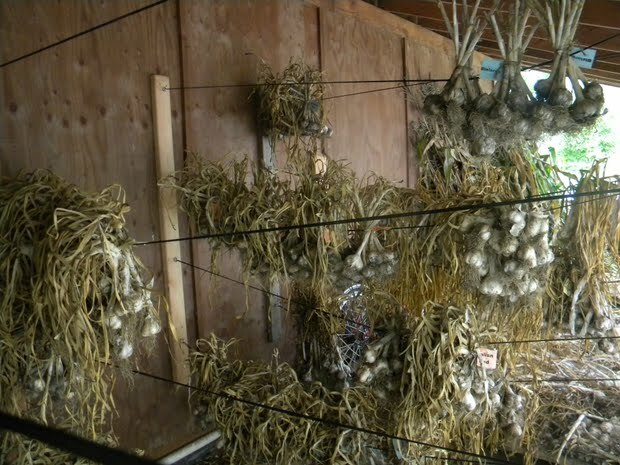 They also rotate their vegetables and herbs so as not to deplete the land of nutrients, save the prime seeds of one year for the next planting, and use drip irrigation to preserve Gales Creek, the farm’s namesake and water source. Gales Meadow Farm has been certified organic since 2001. They use organic fertilizer and no insecticide, save for treating aphid infestations with Dr. Bronner’s soap. They love ladybugs, which eat aphids, and loathe the pesky cucumber beetle.Four adult ducks and their eleven ducklings roam around the farm, led by Sgt. Queenie the goose, who was rescued from a wildlife center. As Anne says, these feathered friends are “endlessly amusing,” but more importantly, they are a natural predator of the slugs and grubs that would otherwise demolish crops. They also have three mouse-hunting cats, some chickens (for their own personal eggs) and a big friendly bunny named Stuart. Stuart, once intended to be someone’s dinner, now sits happily eating chard and other leftover crops. Although Anne and René know all the secrets to keeping a small, thriving organic farm, they were not born farmers. She spent thirty years working with the federal government to aid economically distressed communities, while he plays and teaches the guitar, banjo, and mandolin. Now, after agreeing to follow their passion for gardening and vegetables, Anne manages the plants and farm marketing, and René focuses on the soil, machinery, and “big picture stuff.” They have a few rotating employees, sometimes including their own children, who help tend the fields and prepare the meals they all share together. The love for food, land, and all kinds of living things that abounds at Gales Meadow Farm makes it seem so much bigger than its seven acres. Anne and René grow so many crops simply because they want to – they want to bring a variety and vibrancy to the taste buds of their lucky customers. As they did for that class of pumpkin patch preschoolers, they want to bring everyone a deeper understanding of what the earth has to offer. 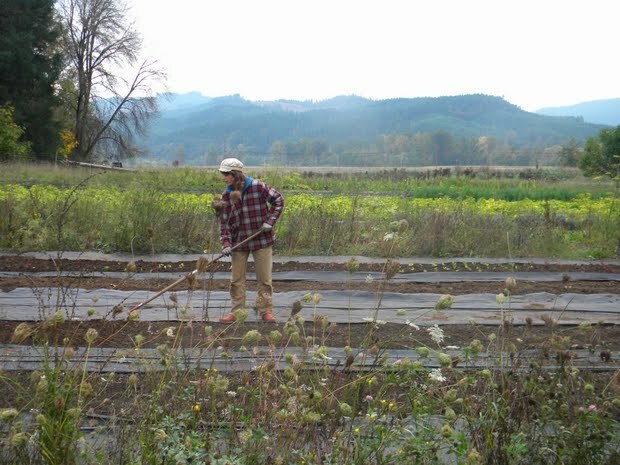 Gales Meadow Farm supplies to Oregon restaurants like Andina, Nostrana, and Abby’s Table. They can also be found at the Lloyd Center Farmers Market, the Hollywood Farmers Market, and the Cannon Beach Farmers Market. Be sure to try one of their six varieties of garlic! This post is from one of the interns in the Real Time Farms Food Warrior Fall Internship Program. These interns are in Asheville, Austin, Nashville, Portland and San Francisco, collecting data, pictures, and video on the growing practices of our nation’s farms, gathering food artisans’ stories, and documenting farmers markets. We all deserve to know where our food comes from! This entry was posted in Food Warrior Interns, On the Farm and tagged certified organic, farming, food warriors, gales meadow farm, katie woods, organic farming, Real Time Farms. Bookmark the permalink.